Minh Phouc was born in Hanoi in 1973 and graduated with a Bachelor of Arts from the Vietnam University of Fine Arts in 1997. In 1999, his works were exhibited in China and he won the Philip Morris Encouragement Prize at the Asian Art Awards. The following year, he held his first solo exhibition, Magic Garden, in Hanoi and subsequently participated in many other group exhibitions in Hanoi and USA. Minh Phouc is a member of the Hanoi Fine Arts Association and currently lectures at the Vietnam National College of Music and Art. Adopting an Eastern approach to all his works, Phouc strives to attain a balance in the various aspects of his life. He strives to achieve peace of mind despite the restless human soul, amidst the bustle of contemporary urban life. Phuoc's signature monk pieces have earned him a following in both his native homeland and amongst international audiences. 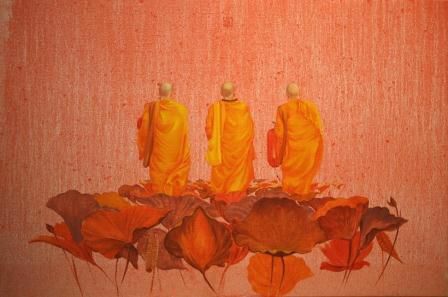 Phuoc's art focuses on the iconic image of a monk or group of monks, viewed from the back, travelling onwards in a purposeful journey. 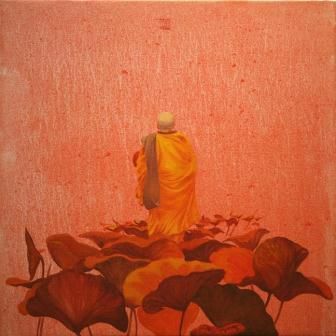 The backgrounds of his works vary from pagodas of temples, to tree-tops, to deep colour fields of vermillion. The simplicity and two-dimensionality of the backgrounds serve to contrast the detail of the monks' robe, as every fold and shade is enhanced with sharp focus. The viewer is treated to a serenity that makes Phuoc's art truly remarkable.